Giant pandas live by their own rules. Or maybe more accurately, they live by their stomach’s rules, which seems to wake them to eat, even in the middle of the night. This isn’t because they need to chase their food down of course, since the bamboo isn’t going anywhere. It’s also not because their metabolism is running hot, like a human infant that needs to feed every four to six hours. Instead, it’s more likely a case of evolution not creating a system any more efficient than is necessary, and in the pandas’ case, this weird lifestyle works well enough. In 2010, five giant pandas were outfitted with GPS tracking collars so that their movement and activity could be tracked for two years. This study was the first of its kind, as the Chinese government had long been hesitant of putting trackers on the animals in case they were in any way disruptive. The study was worth it though, as the data showed some of our notions about panda activity were right, but that we really didn’t understand their daily routines. Three square meals a day, er, night? That routine started with breakfast in the morning, followed by a period of lower activity until the afternoon, and then another lull until they got up for a midnight snack. This clashed with previous assumptions that pandas were crepuscular animals, which would have had them most active in the early morning and again at dusk, like many other herbivores. The pandas seemed more responsive to local food and water quality than the sun, which might be explained by their ecosystem and their digestion. 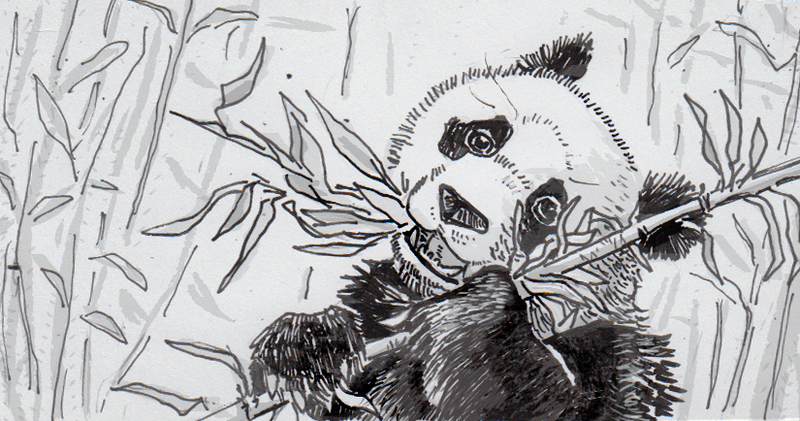 Giant pandas’ digestive tracts aren’t very efficient. Only 20 percent of the bamboo they eat is actually digested, meaning lots of time can be spent eating without much energy or nutrition being gained (especially compared to many other animals, like say, a chicken.) This pushes the panda to be responsive to its digestive system, eating whenever their tummy feels like it’s ready again. This lazy, tummy-led lifestyle isn’t possible for most herbivores though, because they have something else giant pandas don’t: predators. One of the reasons to dine at dawn and dusk is that the softer lighting conditions make it harder to be spotted by predators. Pandas have the luxury of living in an environment without a natural predator, and so they’ve never needed to modify their lifestyle to avoid being eaten. The only chronological influence the researchers noticed was spring. Due to opportunities for either mating or higher-quality food, spring was the one thing that seemed to get the pandas moving a little faster than their usual elevensies.